Balzer + Bray, 9780062207357, 448pp. 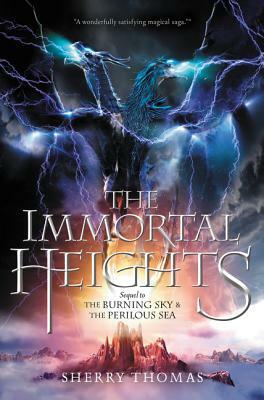 Iolanthe and Titus's mission comes to its thrilling end in the third book in the Elemental Trilogy—perfect for fans of Cinda Williams Chima and Kristin Cashore—which Publishers Weekly called "a wonderfully satisfying magical saga" in a starred review and Kirkus Reviews said "bids fair to be the next big epic fantasy success." In a pursuit that spans continents, Iolanthe, Titus, and their friends have always managed to remain one step ahead of the forces of Atlantis. But now the Bane, the monstrous tyrant who bestrides the entire mage world, has issued his ultimatum: Titus must hand over Iolanthe, or watch as his entire realm is destroyed in a deadly rampage. Running out of time and options, Iolanthe and Titus decide to act now and deliver a final blow to the Bane that will end his reign of terror for good. But getting to the Bane means accomplishing the impossible: finding a way to infiltrate his crypt in the deepest recesses of the most ferociously guarded fortress in Atlantis. And everything is only made more difficult when new prophecies come to light, foretelling a doomed effort. . . .